Iconographies (2013) comprises a series of original press portraits of Cold War-era political, military and religious leaders, each bearing their newspaper editor’s retouches and annotations. The marked photographs reveal an uncanny visual language that at times seems to belie its ostensible functionality. In one, an inadvertent crucifix hangs over the painted turban of an Ayatollah in exile. In another, Arafat’s moustache has been brushed up in a glaringly Orientalist gesture. 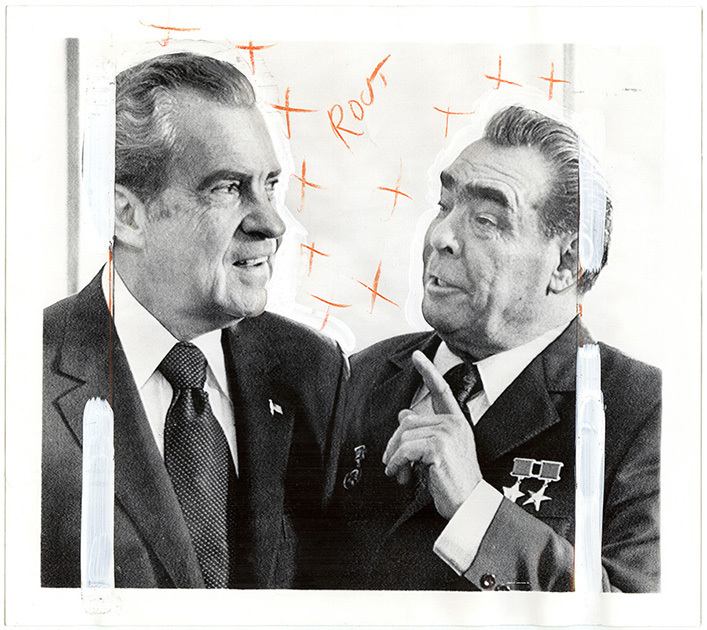 Elsewhere, a photo editor indicates print density with a cloud of crosses that hover like kisses between Nixon and Brezhnev enveloping the word “rout”, while Kissinger regales in a daubed toga. Selected from archives of over half a million images, these small picture-desk proofs have been enlarged and de-captioned, but remain otherwise unaltered. Sold off at auctions that are in themselves a reflection on the decline of print journalism, such relics from a pre-digital age speak to both the careful construction of ideological agendas and the theatricality of popular politics.